PEPPER AND FRANKIE ARE BEST FRIENDS. THEY BOTH LOVE A GOOD ADVENTURE. It's all in the way they approach and prepare for their activities. Frankie is packing up for a weekend skateboarding festival, Wheels in the Woods, while Pepper is planning to take photos of wildflowers. But when Frankie misses her bus, Pepper proffers a ride up to the woods on her motorbike. So far, so good, although Pepper is a bit alarmed when Frankie hitches a ride behind her on her skateboard. On arriving, Frankie urges her sedate friend to stay and watch the skateboarding exploits, and Pepper agrees to take snapshots. And what a photo op! Pepper is mesmerized. She snaps photos perfect flips, ollies, and tailstalls on the half pipe. That's all well and good until Frannie insists that Pepper must learn to skateboard, too. She drags her cautious friend into hopping on the board. Pepper takes some spills and declares that she is done, but Frannie keeps up the encouragement, and soon they are doing a creditable skateboard duet. "If I can do this... I can do anything!" says Pepper. 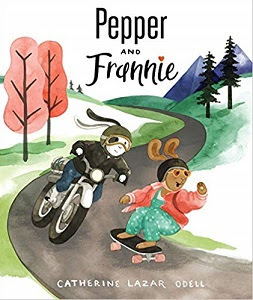 Good friends can widen experiences, as shown in Catherine Lazar Odell's brand-new Pepper and Frannie (Page Street Kids, 2019). One of the joys of friendship is that friends can sometimes introduce us to things we didn't even know we liked to do. Author Odell plays off the differences between her two characters as they discover they have more in common than they knew. Odell's soft watercolor illustrations sweetly portray the two friends finding out new places and ways that they can go together, with more Pepper and Frannie adventures sure to be on the way.